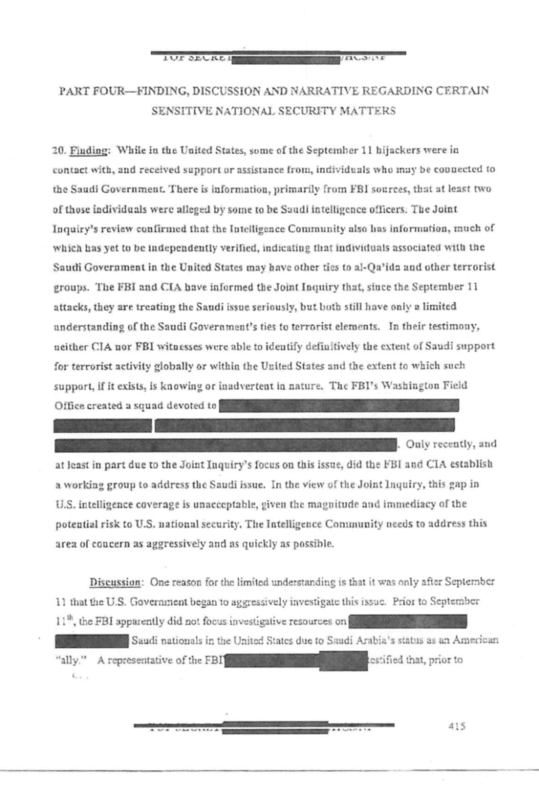 Today the 28 pages were finally released, although many parts are still redacted. They show that Graham was right—several figures in the Saudi Arabian government provided assistance to the 9-11 hijackers from within the U.S. There is “solid evidence” that Omar al-Bayoumi and Osama Basnan, both known as Saudi agents to the FBI before 9-11, provided considerable assistance to two of the hijackers–Nawaf al-Hazmi and Khalid al-Mihdar. Some of this assistance included co-signing apartment leases and helping the would-be hijackers find flight schools. 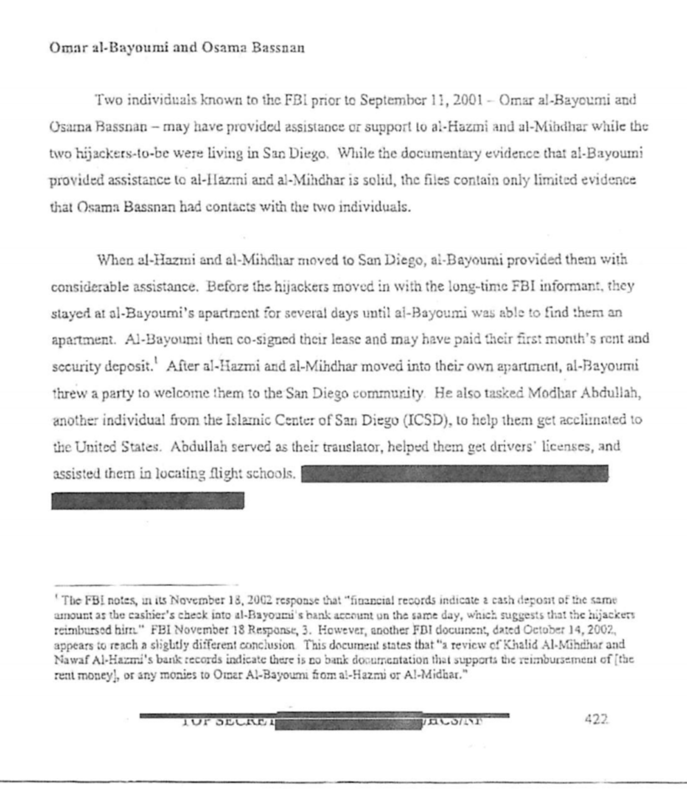 After 9-11, “the FBI discovered that al-Bayoumi had far more extensive ties to the Saudi government than previously realized.” These are detailed in the declassified 28 pages. Also revealed in the declassified pages is that fact that the notorious Abu Zubaida—a Saudi Arabian national currently being held in Gitmo—had telephone numbers linking him through a U.S. corporation to Saudi ambassador Prince Bandar. 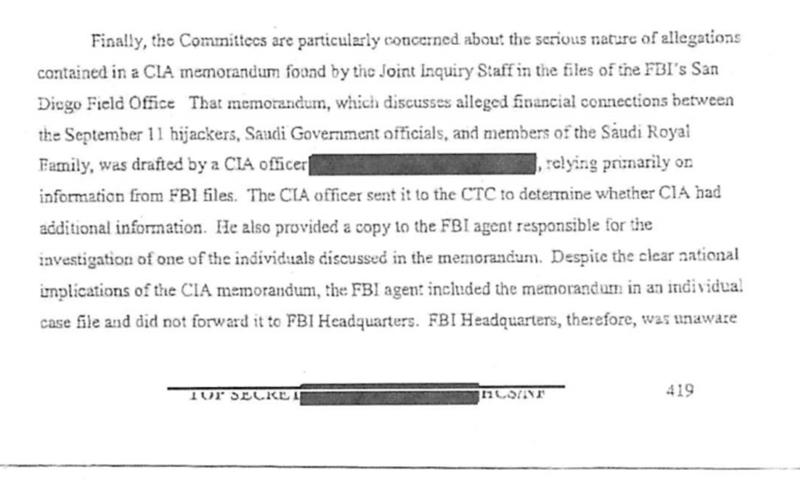 A Saudi Interior Ministry employee stayed at a Virginia hotel with a 9-11 hijacker just before the attacks, but he told the FBI he didn’t’ know them. Agents felt he was being deceptive. The Saudi then faked a seizure and departed the U.S. before further questioning. Saudi Naval Officers were also in contact with the 9-11 hijackers, and the report details other Saudi government officials and terrorist operatives. How is it that these various connections between Saudi government figures and suspected terrorists were not acted upon by intelligence agencies? As we approach the 15th anniversary of the 9-11 attacks, it is clear that the 28 pages will indeed challenge us to rethink everything. Indeed, the Wahhabist dictatorship has had a special relationship ever since U.S. Treasury Secretary signed a secret pact 41 years ago to keep dealings between the countries “strictly secret.” This is how Saudi Arabia can now hold the U.S. economy hostage by threatening to crash the dollar if Congress simply passes a bill. The fact is, Saudi Arabia has a long history as one of the biggest promoters of terrorism in the region. The monarchy follows a hardline fundamentalist branch of Sunni Islam known as Wahhabism, which fuels extremist views among its adherents and has major influence over the rise of ISIS. The 28 pages make it clear that at least several important figures in the Saudi Arabian government were instrumental in helping to carry out 9-11. Whether it was a top-down effort or something fomented by parts within the government may never be fully known. There are other remaining questions, such as what appears to be a controlled demolition of Building 7, which housed a large cache of CIA documents. And how is it that Saudi nationals were allowed to flee the country just after 9-11, when everyone else was on lockdown?